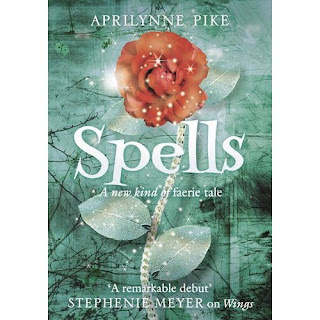 Here are the covers for Spells by Aprilynne Pike. This time it's a very easy choice for me as I much prefer the UK cover - for some reason I'm not overly keen on the US one - whereas I LOVED the US cover for Wings. I've got to say though that I am really looking forward to reading this - if the ending of Wings is anything to go by this should be ace! totally prefer the uk cover!!!! I'm not that sold on either one, actually. Although I have to laugh at the 'old lady book' comment. The UK one makes it look like a book for younger readers... I think they're both just okay. 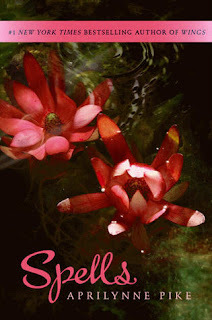 I blogged about the UK cover tonight as well! I hadn't seen the US one. I do prefer the UK one - I love that green. I like the UK one more. I prefer the UK cover... even though an endorsement from Stephenie Meyer would make me run the other way and never pick up the book. I still prefer the US one! I think the UK covers for this series just look too young. I love the UK one, thought the US one is still pretty. I'm really looking froward to reading this! The UK cover is much better, but I seeing Stephenie Meyer's name there. No contest - the UK one! I prefer the one on the left (UK), very pretty! I live in Australia and sometimes will buy a book from either the US or UK depending on my favourite cover. Sick, I know! Hate the US cover, Love the UK one and so can't wait to read this!